• Proprietary "V" design spreads weight over maximum surface from shoulders to center mass area to avoid pressure points. If you have a question about sizing-email us at customercare@agilitegear.com. • The K5 Plate Carrier is, we believe, the most comfortable Plate Carrier on the market. Lightweight, durable and combat-proven by SOF around the world, the K5 doesn't skimp on shoulder or under-plate padding like many plate carriers so it rema...ins comfortable during prolonged use. We know missions or training exercises are rarely "fast and dirty" and so comfort during entire days and nights in your plate carrier is critical. 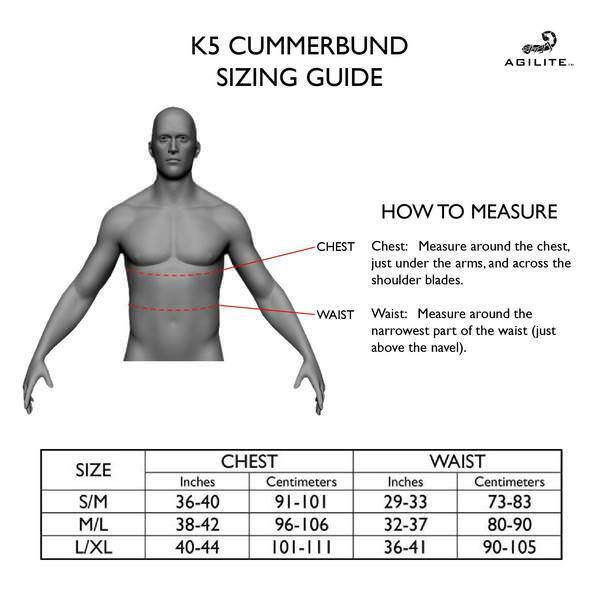 • The K5 comes with the Agilite Stretch cummerbund as standard which allows your vest to be pulled in nice and tight so it doesn't bounce when you run, but the stretch element gives you that inch or so that you need when dropping to your knee so the carrier doesn't squash your torso. • The K5 design is unique in that the shoulder straps create a propitiatory "V" shape to center mass which spreads weight over maximum surface area and relieves pressure points. • The K5 has a number of subtle yet critical features that make it better than other carriers including the ability to attach the AMAP II or AMAP 30 Assault packs directly to it in seconds. No threading MOLLE, no hassle. I get compliments on this all the time.The dudes at my unit love it, the Police I cross train with love it. Everyone loves it! Yall keep up the amazing work and keep bringing quality products to the table! You have a new customer for life! I have owned and deployed with many different carriers over the years and I have to say, this is by far one of, if not the most confertable carrier I have had the opportunity to use. Keep up the great work Agilight and dont ever cut corners like most companies out there. Your product saves lives. Maybe we will get to see a quick disconnect option in the future. Very comfortable, the shoulder pads are a must. i was between the K5 and the Ares Armor. K5 is a lot more comfortable but like the cobra buckles of the Ares Armor. maybe that can be added to Agilite line up for the future instead of the loud velcro? looking forward to trying it out at the range this weekend. Best Plate Carrier you can get!!! Having been a law enforcement officer for 20 years, I’ve worn quite a few vests and plate carriers over the years... I can honestly say this is the most comfortable and best fitting carrier I have ever had. I love it and shipping from Israel to Texas was only about 2 weeks. You can’t go wrong with choosing a K5 carrrier!!! Thank you Agilite! Very well made,very comfortable and is worth the money! If you want it quick,pay for expidited shipping. Otherwise you’ll have it in 2 weeks( But worth the wait)! I’m 5’7 155lbs and the medium size fits perfect. The Agilite Community is a group of like-minded tactical professionals whose passion and search for the best equipment on Earth took them all the way to Tel Aviv, Israel. Talk to us directly and become a part of the Agilite Community!